Fall has arrived… This is usually known as baking season in my household. 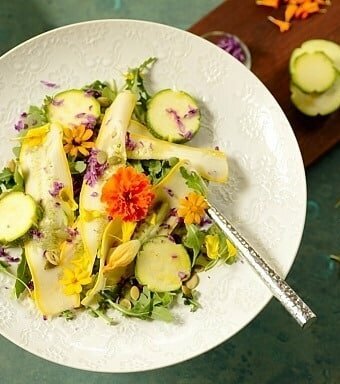 But this year I decided to break this old habit a bit by introducing a variety of recipes, including this fresh and quick Fall Salad (Salada de Abobrinha)… and that is going to be the way we will welcome my favorite season this year. 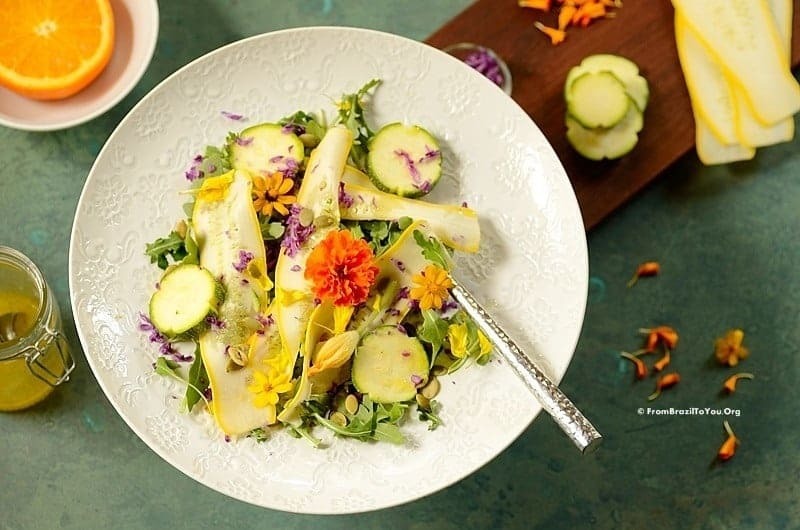 This fall salad is a souped up, fresh version of the Brazilian salada de abobrinha — which is typically prepared with cooked zucchini tossed in lemon vinaigrette. 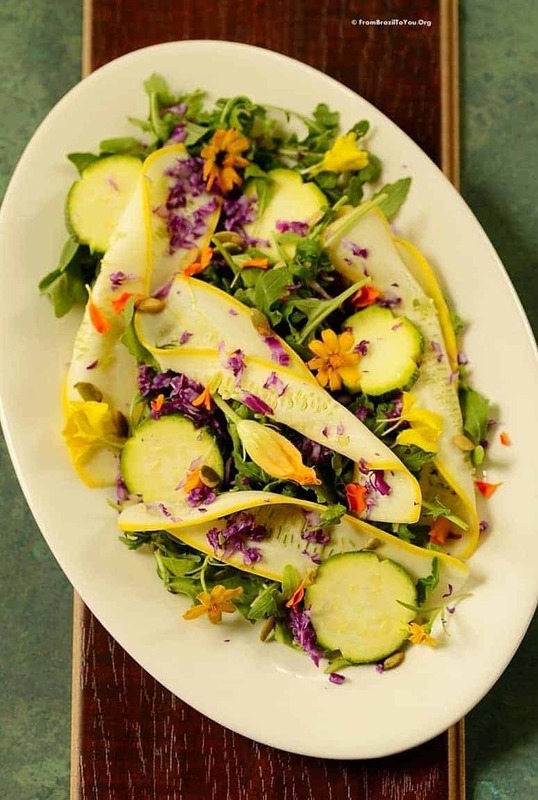 Our version is prepared with fresh zucchini and yellow squash, baby arugula, shredded purple cabbage, edible flowers (optional) and pepitas… and dressed with an orange vinaigrette. It is loaded with vitamins and antioxidants while combining different textures, flavors, shapes, and colors in one plate. Does that sound good to you? 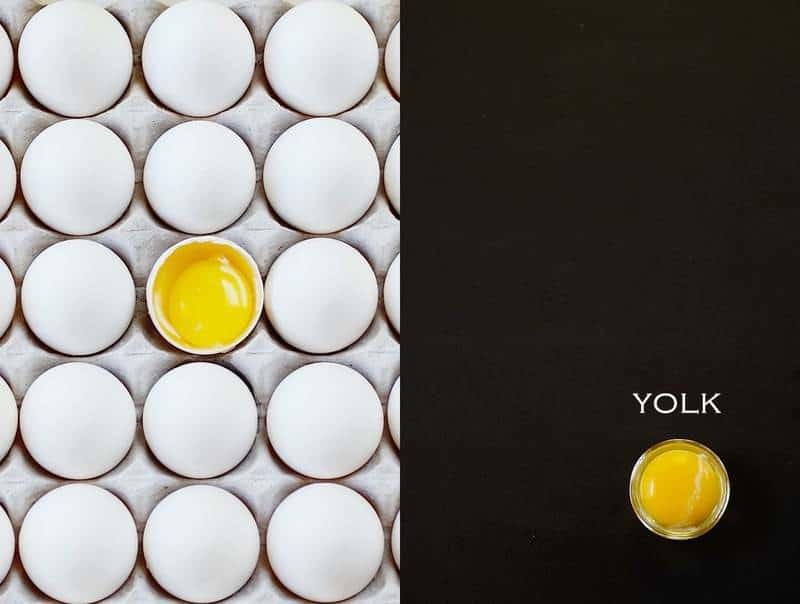 It is so easy and quick to prepare that I still had time to play around a bit with its beautiful ingredients. Folks, this is love at first bite! Its ingredients are seasonal, tasty, and you won’t have to cook a single thing. Of course, if you aren’t a fan of fresh uncooked zucchini and yellow squash, you can easily cook them in boiling water for two to five minutes or until al dente and then blanch them in ice water… Yes, it’s that easy! This fall salad works well as a main dish for vegetarians, or as a side accompanied by any type of meat. If you love eggs, they also make a great addition to the salad. It’s really up to you! Well, enjoy healthy happiness on a plate and have a marvelous fall season! 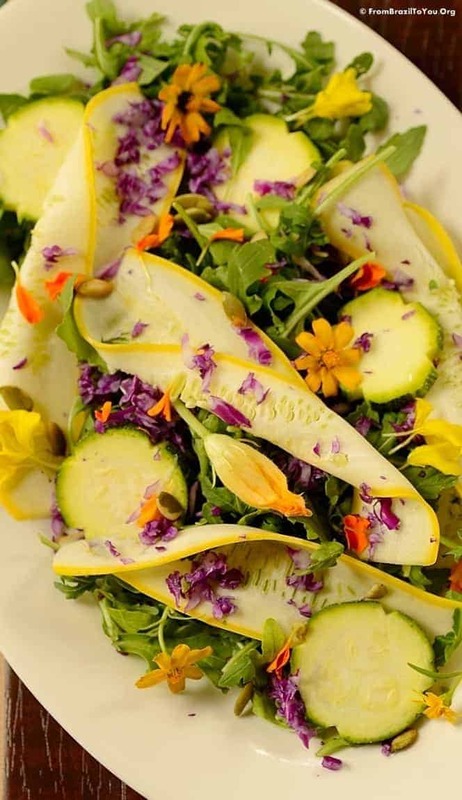 A fresh, tasty, and quick Fall Salad made from arugula, yellow squash, zucchini, edible flowers (optional), and pepitas (pumpkin seeds), dressed with orange vinaigrette. To prepare the salad, place baby arugula into a large bowl and set aside. Working with a mandolin or sharp knife, thinly slice squash lengthwise/ horizontally and place into the bowl. Then, slice the zucchini crosswise or into rounds and place into the bowl. NOTE: If you prefer to eat the squash and zucchini cooked instead of raw, you can put both sliced vegetables into a medium to large pan filled with boiling, salty water and let cook for about 2 minutes. Drain in a colander and then place cooked vegetables into a large bowl filled with ice water for about 30 seconds. Drain and shake to remove excess water before placing into the bowl with the baby arugula. Mix in the shredded cabbage, and flowers (if using them)... and also the pepitas. Set aside and prepare the orange vinaigrette. For the orange vinaigrette, place all ingredients into a mason jar, tightly close the lid, and shake vigorously until mixture is homogeneous. Open the jar, taste and adjust the seasonings if necessary, and dress the salad, mixing in until combined. Serve immediately as a side dish and enjoy! I love the colors Denise, definitely makes me think “fall” and it’s so fresh and vibrant. I’m ready for a fork! What a wonderful salad! I’m still harvesting squash from our garden. This is the perfect recipe to make the most of the bounty of late summer. Great idea dear Denise! A dish full of flavor with high nutritional value! This is the kind of salad I like..simple and soooo fresh!!! Lovely colors, Denise, and I like the way you did the ‘channeling’ designs on your zucchinis. We’re moving into spring/summer here in Australia so your Fall Salad will still work nicely here! Beautiful salad Denise! It’s so vibrant and filled with Autumn flavours and colours. 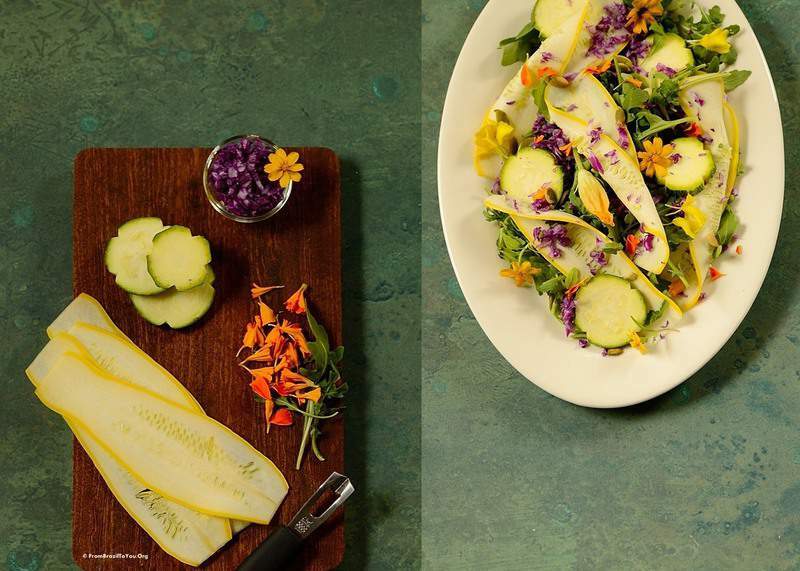 Beautiful pictures, Denise, and the salad combinations sound so good, fresh and appealing! 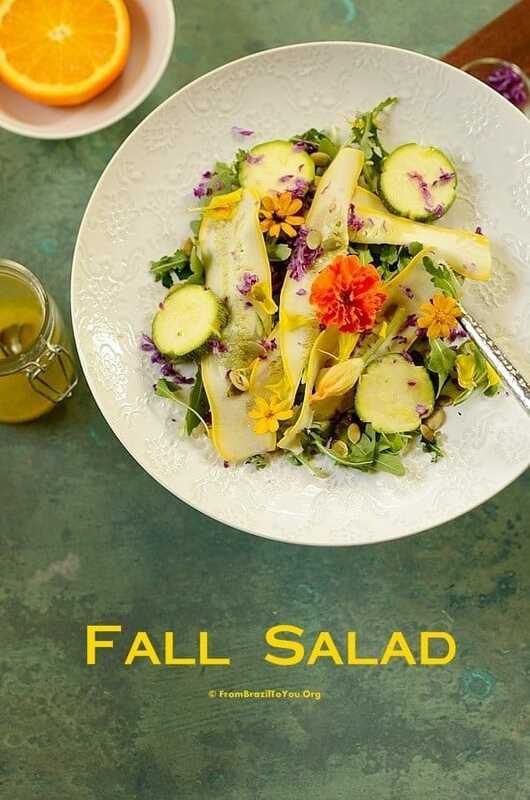 Your fall salad looks very spring to me. It’s beautiful!